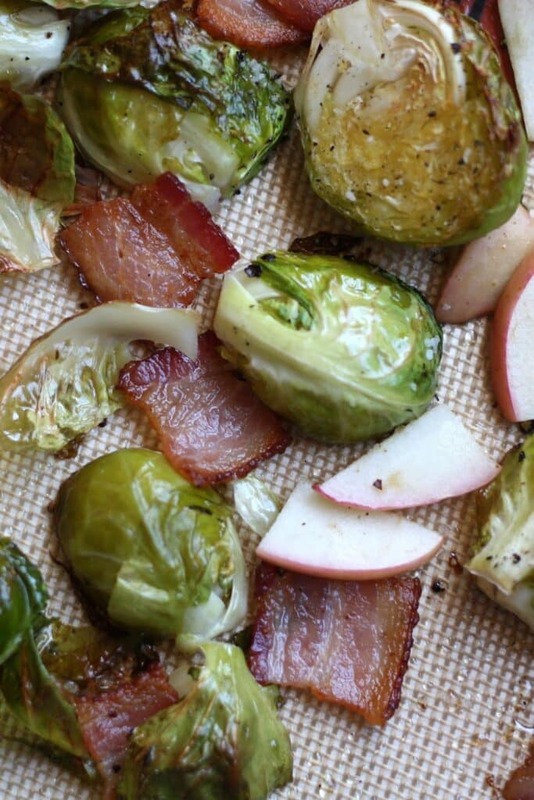 These Roasted Brussels Sprouts bring together salty bacon, sweet apples and caramelized Brussels sprouts for a truly outstanding side dish. This Brussels sprouts recipe one of those dishes that I kept hearing about from friends over and over again. Eventually, I couldn’t resist trying it myself. And I’m so very glad I did! Oh. My. Goodness. Absolutely DELICIOUS. I am confessing now that as I was taking this picture, I probably ate about a third of this dish. Yes, I am officially nuts over Brussels sprouts. Even my kids who are skeptical of vegetables absolutely devoured these Roasted Brussels Sprouts. It’s a vegetable side dish that pleases everyone in the family. Five years after making this Brussel Sprouts Recipe for the first time, this is still a family favorite. My kids happily eat Brussels sprouts when they are served this way and everyone else that has ever tried this in my home has raved about it. I’m not exaggerating a bit when I say this is one of my all-time favorite side dishes. What’s the secret to Brussel sprouts that are not only edible but delicious? There are a few things happening in this recipe that contribute to its “wow” factor and turn a vegetable often known for being bland and rubbery into something you’ll crave. The first key to spectacular rave-worthy Brussels sprouts is roasting. If you’ve never roasted Brussels sprouts you’re really missing out. Brussels sprouts are essentially tiny cabbages with lots of layers of small leaves. Oven roasting locks the fat into the folds and layers of each sprout and results in a tender interior wrapped in a crispy layer on top. Roasting also brings out the slightly nutty, earthy flavor of Brussel sprouts that’s enhanced even more by the other ingredients in this recipe. 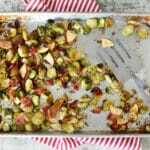 The addition of bacon and apples to the roasting pan where you’re cooking the sprouts is the other factor that makes this recipe stand out. 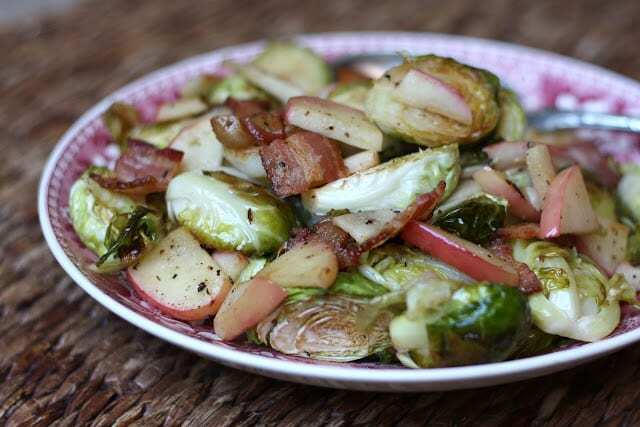 A splash of red wine vinegar adds a little tang to balance out the savory and salty flavors from the bacon, the sweetness of the apples and the earthy flavors of the sprouts. Once you try making Brussels sprouts this way, you will NEVER boil them again! Brussels sprouts can be roasted in a variety of oils and fats. Olive oil and canola oil work well but since this recipe already calls for bacon, I put the bacon grease to work. 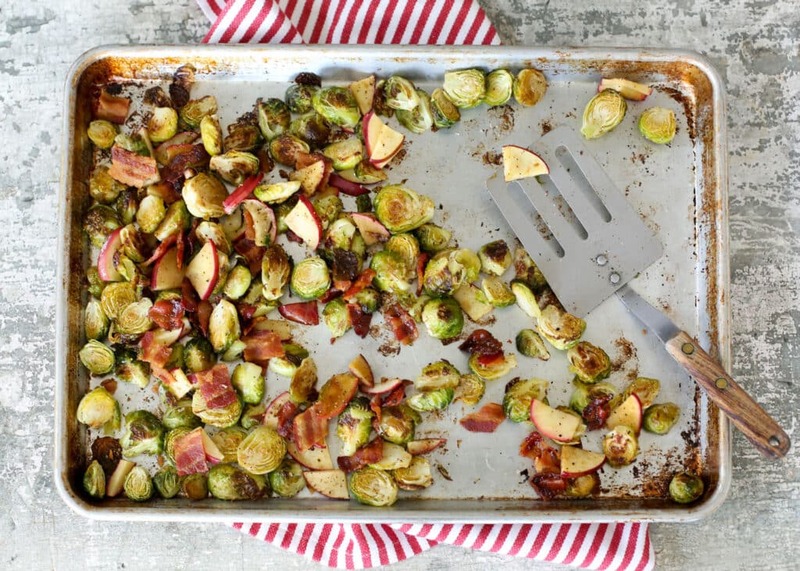 Cooking the bacon in the same pan that you’ll use to roast the Brussels sprouts keeps the dishes you need to clean at a minimum and optimizes the flavor! That’s a win-win in my book. While the bacon is cooking, prep your Brussels sprouts by rinsing them, then trimming off the root end of each sprout. Cut the sprouts in half as well. Once the bacon is nice and crisp after a few minutes in the oven, add the trimmed and halved sprouts to the pan. Give them a toss to make sure they’re fully coated with bacon grease then season generously with salt and pepper. After your sprouts have spent enough time in the oven to begin to brown (about 15 minutes), add chopped apple pieces and continue roasting until the apples have browned as well. Remove the pan from the oven, drizzle a teaspoon or two of red wine vinegar over the whole sheet and toss the sprouts and apples to coat. Serve these Roasted Brussels Sprouts right away to enjoy them while everything is still hot and crispy! If you have leftovers, you can store them in an airtight container in the fridge and reheat but they are definitely at their best served right out of the oven. 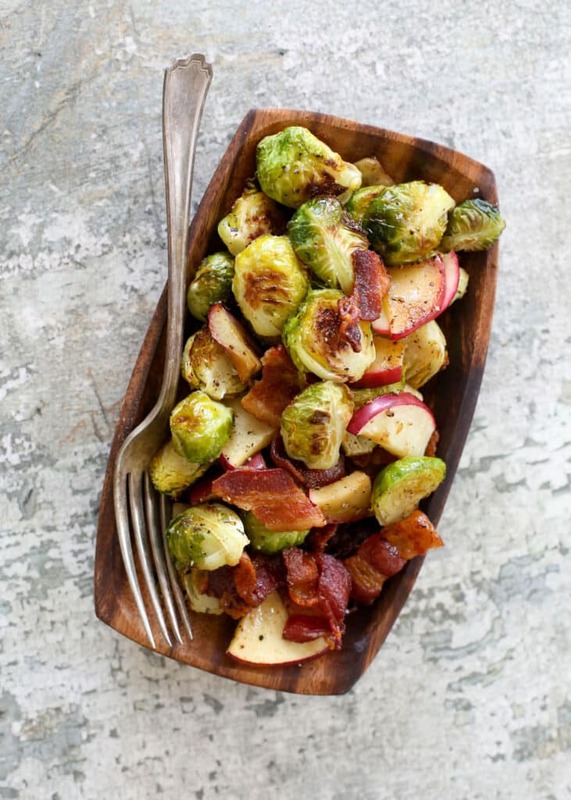 Roasted Brussels Sprouts with Bacon and Apples go well with just about any entree you can think of. 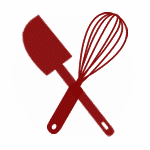 Try them with Baked Chicken Thighs, Pan Fried Pork Medallions with Creamy Wine Sauce or Garlic and Paprika Rubbed Steaks. This recipe would also make a phenomenal side dish for Thanksgiving, Christmas and any other holiday. Imagine this on the table next to a Balsamic Dijon Glazed Ham or Roast Turkey with Wine and Herbs. Like me, you might find yourself wanting to make Roasted Brussel Sprouts over and over again but in the event you want to mix things up, here are some other ways to enjoy Brussel Sprouts you might like. Roasted Red Potatoes with Brussels and Sausage is another of my favorite side dishes and ways to eat sprouts. These Brussels Sprouts with Grapes and Walnuts by Rebecca over at Foodie with Family are a vegetarian-friendly side dish with plenty of crunch thanks to the addition of walnuts and just a touch of sweetness from juicy red grapes. Easy Brussels Sprouts Gratin by Kalyn’s Kitchen is a creamy, cheesy way to get your veggies and this Bacon and this Bacon and Brussels Sprouts Salad by Recipe Girl is not to be missed. For a pasta dish that incorporates Brussels sprouts and pancetta (Italian Bacon), check out this Brussels Sprout Carbonara by The View from Great Island. Whether you’re a long time lover of this underrated vegetable or a Brussel sprouts skeptic, I think you’ll love this recipe. Are you ready to make the best Roasted Brussel Sprouts you’ve ever had? Preheat oven to 425 degrees. Arrange bacon in a single layer on a large baking sheet. I lined my baking sheet with the silpat mat, but I’m not certain it was necessary. Bake for about 10 minutes, until cooked through, but not yet crispy. Remove the bacon pieces from the sheet and set aside. Add the Brussels sprouts and toss them in the bacon drippings. Make sure they are as well coasted as possible. Season well with salt and pepper. Roast them until they begin to brown, about 15 minutes. Add the apple pieces and the cooked bacon to the Brussels sprouts on the baking sheet and roast until the sprouts are tender and browned and the apple has softened a bit, about another 10-15 minutes. Toss everything with the vinegar and serve immediately. Preheat oven to 425 degrees. Arrange bacon in a single layer on a large baking sheet. I lined my baking sheet with the silpat mat, but I'm not certain it was necessary. Bake for about 10 minutes, until cooked through, but not yet crispy. Toss everything with the vinegar and serve immediately. Enjoy! Can this be reheated if cooked the day before? This reheats fine. However, the Brussels sprouts and bacon won't be quite as crisp. I eat the leftovers often. I've never intentionally made it the day before to reheat and serve though. This looks amazing. I want to try it, but I will be bringing it to my mothers house for Christmas Dinner. Can I prepare this ahead of time and warm before serving? If you like balsamic, you could substitute it for the red wine vinegar.